Atheism: Proving The Negative: Debate: Did Jesus Return from the Dead? 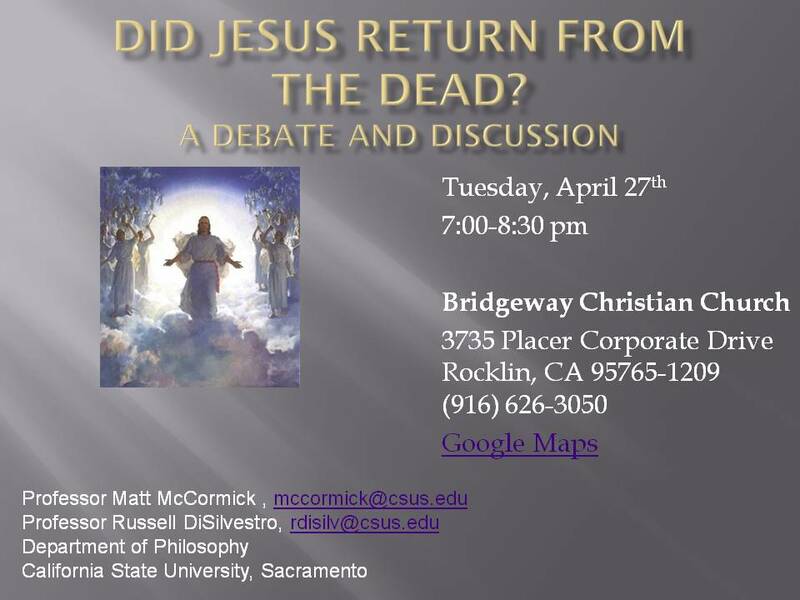 Debate: Did Jesus Return from the Dead? 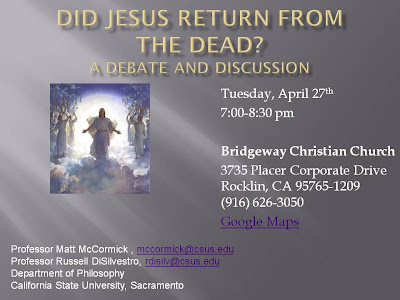 One of my colleagues, Prof. Russell DiSilvestro and I are going to have a debate and discussion at a Sacramento church about the evidence for the resurrection of Jesus. If you've read the blog in the last year or so, you've seen a lot of arguments that I have developed for the conclusion that it isn't reasonable for us to believe on the basis of the crummy little body of evidence we have. Prof. DiSilvestro is a Christian and has the view that there is a compelling historical case to be made for the resurrection. He's a sharp guy and he's very interested in this question, so this should be a very stimulating discussion. Here's the announcement. If you're in the Sacramento area, I encourage you to come and participate. If nothing else, you'll get to see me on a church podium. That's got to be worth something. And I confess that I've had a secret wish to get invited to a big church to do this for a long time. Hopefully somebody films it and puts it up on YouTube, since I'm currently out of the country. Best wishes. I'm sure you are aware that having good arguments and having good debate skills are not one and the same. I concur with Tristan: Please film it! I'll try not to read anything into the fact that nowhere on the church's website do they say anything about the debate. Here's the first part of my report on the debate.